We create a program that is designed & tailored to meet the needs of our customers, which we will provide for the complete care of their landscape through timely delivery of services and for the purpose of maintaining an outside environment that will prove to be an asset and will enhance the enjoyment of the grounds by the owners. Our office is convenient for access, located in the Greater Plymouth Township area of Montgomery County. All landscapers are not created equal, with Brad Byrne on your side you will have a leading-edge expert with knowledge of the industry and insight into the neighborhoods. This is critical because you may need advice on special projects and Brad understands that service is Number One. Brad is a “listener” not a “talker”, who knows the key to success is meeting your needs. He accomplishes this with a responsiveness, detailed, orientation and a wholehearted commitment for doing what is best for you and your property. Our range of services include Lawn Mowing, Lawn Grooming, Planting, Mulching, Sodding & more to meet your needs! Our program ensures our customer’s lawns are in the greatest and healthiest of condition! 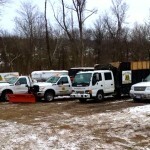 Let us Clear the Snow & Ice from your Driveway, Parking Spaces, Fire Lanes, Dock Area and Walkways! Lawn Aeration is one of the most important cultural practices you can do for your lawn. The benefits are endless. Now is the time of year to seed. This time of year the weather is perfect for seeding those thin or bare spots in the lawn. Slit-seeding for those bare areas and thin spots, Or do a full over-seed of your yard to add some new grass with better tolerance to heat and disease. On top of all that add in topdressing with compost. This will add even more benefits for your lawn. The list is endless with the benefits to your soil and lawn. Your grass will thank you in many ways with the addition of aeration, seeding and topdressing. Contact Us by Phone or Email, so we may answer your questions or request your Free Estimate!